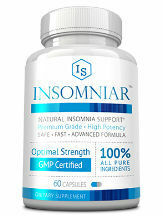 This review provides comprehensive details of a product called Insomniar, a product designed to help address insomnia and the issues that it brings. For consumers searching for an all natural solution, this is a great read. Insomniar’s all-natural ingredients have been formulated to provide support for those suffering from the often debilitating condition of insomnia, sleeping disorders and those that can’t achieve a restful or balanced sleep during the night. The manufacturers of this product have done their research including key ingredients to address the issues of insomnia plus they confidently back up their belief in their product by offering a great money back guarantee. This product has been formulated using a variety of ingredients that are all natural and proven to help overcome insomnia. The instructions that come with this product are simple, concise and easy to follow. The user is recommended to take 2 to 4 capsules, as necessary, an hour before going to sleep. This is a dietary supplement and it should be treated as such. The base price for one single container is $49.95 but the customer can take advantage of several multiple pack offers. However, for long-term support and optimal benefit, one bottle (in the beginning anyway) may not be sufficient. This manufacturer offers significant discounts when ordering several months worth of supply which we think is great for consumers who want to long term support. For example, the price reduces to $34.95 per bottle if two bottles are purchased. The discount doesn’t stop there as the price drops down to $23.30 if ordering 6 month’s supply. In this case, consumers are actually benefiting from a 50% discount and only paying half the listed price per container – we think that this is great value. There are no common adverse reactions from the ingredients used within this formula and we were unable to find any consumers who noted any negative comments from taking this supplement. While no adverse reactions are apparent, users are advised to avoid driving or operating machinery (after taking) due to the remedy’s melatonin content that could have an influence on the body’s response time. If you follow the guidelines of when to take this supplement, there should be no problems at all. As with any supplements or medication, consult your doctor or physician before consuming. Also, pregnant or nursing mothers, children under 18 and individuals with existing medical conditions are also advised to consult with their doctor before consuming this product. The manufacturer stands behind his product with a solid two-month (60 days) full money back refund guarantee. Consumers have the option of being able to return any unopened and open bottles if they are dissatisfied for some reason, and they will receive a full refund. We found several consumer reviews that were present on the product’s page which stated highly positive comments with most customers stating that they are entirely satisfied with the product and service, with many suggesting that this has been a life saver. It would seem that many have found that they function much better during the day due to the restful fulfilling sleep that they have during the night. Insomniar is a good all natural support formula that provides benefits like no other. The manufacturers have given a lot of thought about the formula and included only key ingredients to address the issues of insomnia. The consumer feedback is the best we have seen for any insomnia product out there. Insomniar has been well researched and is aimed to target the root causes of insomnia as well as address the challenging symptoms. This dual action approach works positively to provide support and nourishment for the body in order to address the issues of sleep problems. This manufacturer also agrees and very cleverly provides buyers with a range of purchase options with some huge discounts for the ultimate saving for multiple buys. Their money back guarantee confirms what we already know, this is a product that can be trusted and relied upon.